The link between unchecked population growth poverty and other economic issues were the key topics of the Family Planning Certification and Forum on Responsible Parenthood, organized by the Philippine Obstetrics and Gynecological Society (POGS), and Bayer Philippines. Speaking at the forum, NCR regional director for the Commission on Population and Development Lydio Español introduced the concept of economic dividend, which occurs when population growth is kept to reasonable levels. “In 1969, we had a population of around 35 million, almost the same as Thailand’s around 36 million, and South Korea’s around 32 million. In 2018, after 49 years, the Philippines had tripled its population to 107 million, Thailand just doubled, South Korea less than double,” said Español. The ideal ratio is 2.1 children per family. The Family Planning Certification and Forum on Responsible Parenthood seeks to equip doctors with the basic techniques in contraceptive counseling and to inform them of the different methods of contraception and their application to women’s individual reproductive needs. “As medical practitioners, we are in a unique position to advise patients on sensitive yet critical matters such as the significance of responsible parenthood and the role of family planning in securing the overall health and well-being of the community,” shared Mario Bernardino, MD, president of POGS. The session also aims to understand the most common objections to starting women on oral contraceptives, as well as their reasons for discontinuation and switch to other forms of contraceptive methods. “Bayer has always been a strong advocate of family planning and women’s healthcare. 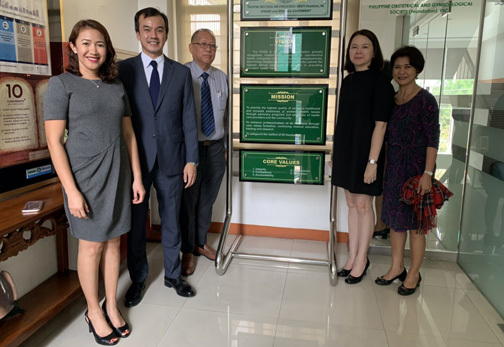 We are happy to partner with POGS in our shared objective to educate women about their reproductive health options,” said Jun Il Kim, country division head at Bayer Pharmaceuticals. The year-round forum will be conducted in different parts of the country. It will seek to empower practicing OB-GYNs with the information and tools they need to counsel and educate their patients on different types of contraception, including special groups such as victims of violence, women of limited education, and those with other pressing medical conditions.